TAOISEACH LEO VARADKAR and Fianna Fáil leader Micheál Martin have spoken tonight about renewing the confidence and supply (C&S) agreement. 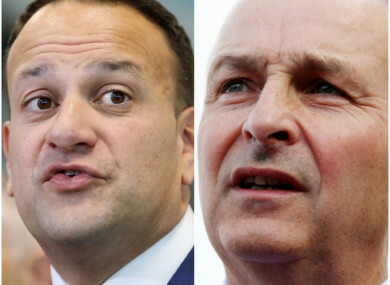 Martin and the Taoiseach agreed their staff would agree a process for reviewing the agreement, with Varadkar telling RTÉ’s Six One News that a deal can be done by the Halloween break. However, sources within the Fianna Fáil party have said there is no way an agreement can be done by the Halloween recess. For the everyday punter concerned with some of life’s real problems like housing, rent, homelessness and hospital waiting lists, these words might not mean much – but essentially, it is the deal Fianna Fáil signed up to facilitate Fine Gael setting up a minority government. Even though Fianna Fáil are the opposition, they have agreed to support the government on some of the big issues, like getting a Budget passed. The deal states that Fianna Fáil will facilitate three Budgets– the third of which was today. The agreement made headlines this summer when Varadkar indicated he was anxious to begin talks about extending the deal ahead of Budget 2019. Last December, the Taoiseach said he could see no reason why the confidence and supply agreement could not be extended past a third budget. Tonight, Varadkar said the two parties agreed to engage in talks, with both parties appointing negotiating teams. While the Taoiseach said Martin wants a detailed review, Varadkar wants renewal talks and a new programme agreed, similar to one he set out in a letter to the Fianna Fáil leader he published in August. Varadkar said if both sides “engage and engage seriously, we can get this done by Halloween”. The confidence and supply talks after the 2016 election took over nine weeks to agree. With talks of a new deal on the table, there is speculation in Leinster House that a winter election could be on the cards. “If it looks like an election budget, and sings like an election budget, then it’s an election budget,” said Labour’s Joan Burton. Finance Minister Paschal Donohoe said he wants the C&S negotiations to begin “as soon as possible”. He added that an election date in 2020 should be agreed, adding that with “good will on both sides” a deal can be struck. Email “Taoiseach says confidence and supply deal can be done by the Halloween break ”. Feedback on “Taoiseach says confidence and supply deal can be done by the Halloween break ”.